This isn’t the first disaster-type movie I’ve seen, but I found it a really intense viewing. I was sitting on the edge of my seat for a lot of the film, drawn in very quickly. Almost from the start, it was obvious how intense this movie was going to be. It was good to see something of the work that Ray did and what went into being part of a rescue team. I really like Dwayne Johnson as an actor and I thought he worked really well in the role of Ray. It was also good to see some of the family situation that Ray was in. I liked Emma and Blake and I was intrigued by the obvious tragedy their family had suffered. It was also really good to see that Emma and Blake were really strong characters in their own rights. 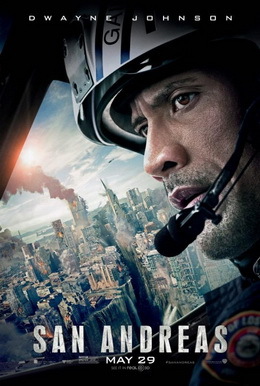 Many of the scenes with the earthquakes in during this movie made me tense up and hope for the safety of the characters. I didn’t think this film let up a great deal. It was good, but the action was fast and hard-hitting… with very few moments to diffuse the tension. Though I have to say that there were a few amusing moments in this movie, particularly with Ben and Ollie. Ollie was probably my favourite character in this movie, even though I did like most of them. I enjoyed seeing the real brotherly affection between him and Ben and how Ben continued to treat him as a priority. Too many romances show family members being treated as much less important than the love interest and it was good to see that didn’t happen here… though they did pick the wrong times to share a kiss. One of the things I thought was really good in this was that the movie showed people helping each other. There was one particular scene right at the beginning that I found really emotional. I also thought it was good to see the effects of the earthquakes in another part of the world. I recognised quite a few actors in this movie and I liked them in their roles… even the characters I didn’t particularly like. This is a film I would probably enjoy watching again, especially because I do like the family style relationships more than romance.